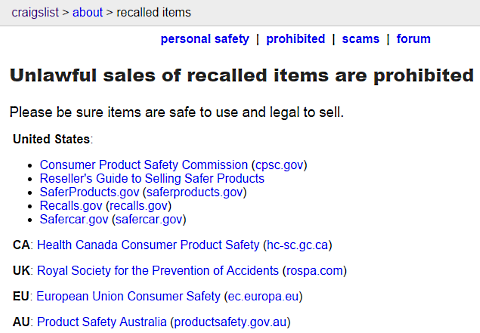 Enterprising sellers tried to flog the listeria-ridden sweet treat on eBay, too. 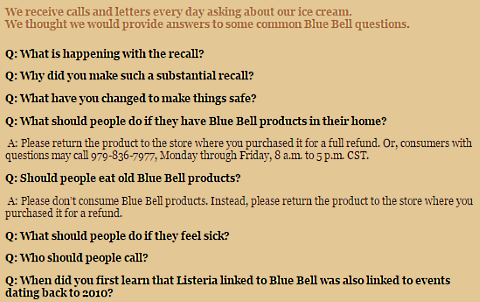 When you heard Blue Bell was recalling all of its ice cream after it tested positive for listeria, did it make you sad? Did you still want to eat a pint of Krazie Kookie Dough? We have great news for you. If you have a lot of money, and you like living dangerously, you can buy some recalled ice cream from the freezer of an anonymous Craigslist seller—at least, we hope it’s in the seller’s freezer. Like all CL transactions, we don’t know how this thing is being stored. Also, It’ll cost you $10K. What we have here is one pint of unopened Bluebell goodness. Purchased just mere weeks ago, this is like an oasis in the desert for you ice cream lovers. Buyer assumes all responsibility for transport, and or any Listeria contracted from product as well. I will not distribute by the spoonful or part out. Cash offers only, price is firm. KEYE-TV in Austin reports that this seller has only had one offer so far: $20 to lick the lid. Don’t like Krazy Kookie Dough? How about some competitively priced Caramel Turtle Cheesecake? It even comes with the added reassurance of one bowl missing (no information on the size of said bowl) to prove that it’s listeria-free. What a bargain! If that’s too rich for you, another seller has half a tub of “Homade Vanilla” (original tub size unspecified) available for just $500. 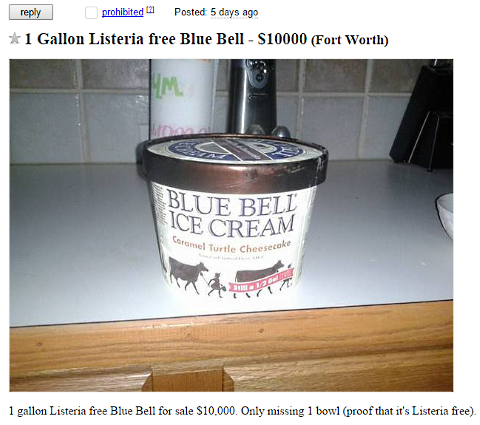 Even better: This seller is willing to sample the Blue Bell right in front of you, should you show up with cash in hand! You might have to wait around for a while before any possible listeria hits the seller, so we hope your phone has a full charge. This Houston seller claims to have a whole bunch of Blue Bell half-gallons, and is offering them for close to their original retail price of $5 apiece. 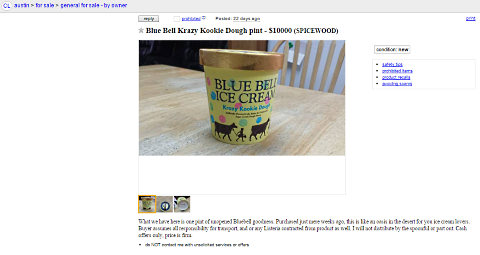 Since the FDA revealed that the Blue Bell listeria problem dates back to at least 2010, we doubt this ice cream is actually “pre-listeria,” as the seller claims. If it actually is, we probably wouldn’t want to eat it for quality control reasons. eBay is dedicated to providing a safe and secure marketplace for our customers. We have removed this listing as it is in violation of our recalled items policy, located here. Still want Blue Bell? You do you.